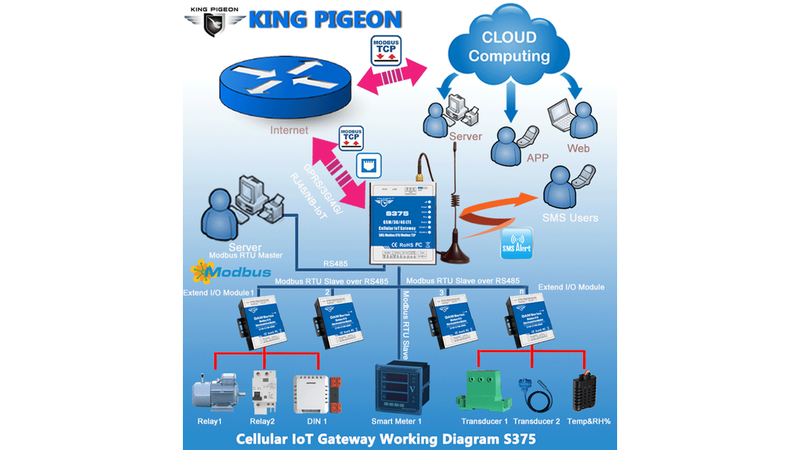 The Cellular IoT Modbus Gateway inbuilt TCP/IP protocol stack make it suitable for internet of things (IoT) applications, it can be easily to operate by the provided cloud, app, and web server, or integrated to you IoT applications according to Ethernet or the TCP/UDP protocol, or integrated to SCADA systems by standard Modbus TCP protocol, too. The Cellular IoT Modbus Gateway is designed for working in the harsh industrial application environment, widely used in a variety of industrial automation, security monitoring system, automatically measurement and control system, BTS monitoring, remote data acquisition, telemetrically systems, automatically control system. It can be used as a remote RS485 data transmission, remote extend I/O tags control, remote smart PLC, meters monitoring. The Cellular IoT Modbus Gateway supports 2 RS485 transparent data transmission and performs as Modbus Slave over GPRS/3G/4G/NB-IoT network and RS485 serial port. Moreover, the Cellular IoT Modbus RTU can be used as Modbus RTU Master to reading smart meters, I/O modules, PLC, and converts to SMS alert once triggered the threshold value, or transmit data to remote server over GPRS/3G/4G/NB-IOT network. 2 RS485 ports can be used one as Modbus RTU Master and the other as Slave at the same time.